Demonstrate that internet use is a part of “normal”, everyday life. 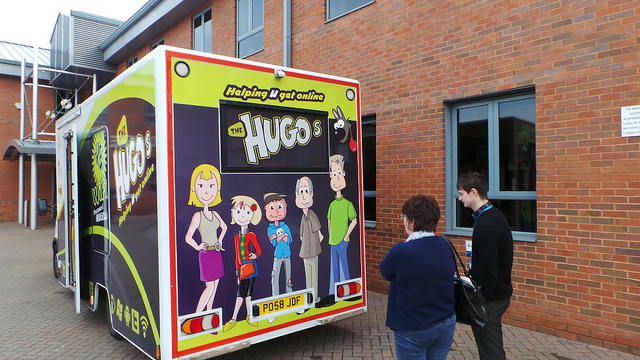 I helped Leeds Federated Housing Association secure funds for the HUGO project, a multi-faceted digital inclusion initiative, encompassing a digital inclusion Hub at the Association’s headquarters, a mobile HUGO bus (see below), and which has spawned other ideas such as a Digital Laundry, and Digital Tea Parties. This project is being viewed as a model by many other social housing providers and partners, and I spoke about it at a cross government digital inclusion seminar at the Department for Communities and Local Government in April 2014. Part of my philosophy is that we need to harness the enthusiasm of the already digitally engaged in the community to bring their fearful peers on board with them. The HUGO project is doing this by reaching out to them through social media. When the HUGO bus hit the road, it used the on-board kit to blanket the local area with free wifi. This is designed to bring those who have devices they want to connect out to the bus to use the wifi and find out what it is doing. 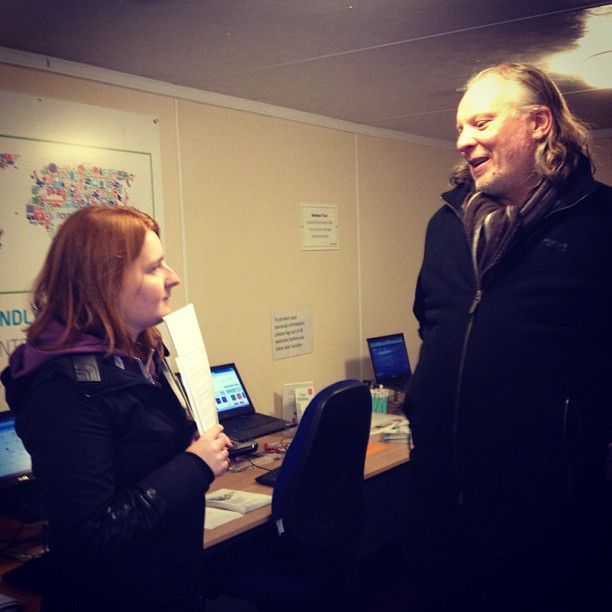 A large part of the work I have done on Rural Broadband has been based on these principles, as many people in rural areas don’t know what they are missing out on. In July 2014 I was named by The Guardian as one of the UK’s top 5 Digital Inclusion tweeters. True! And as someone who tried to fill in a tax return online, the experience made me never want to try again. Actually though, I’ve often wondered why someone in Government doesn’t look at the original French Minitel success story and try and set up a nationwide system that would enable the majority of the population to (a) get connected to the Internet, and (b) make Government services easy to get access and use. It was free to use, and every household was lent a terminal which would enable them to access France Telecom’s Yellow Pages for free but also to access other, varied services for a small fee. We’ve recently seen that even a Raspberry Pi Zero can perform an incredible amount of work and costs £5, so why not invest in building a device with a similar spec that can access the Internet as a “black box” and plug the other end into a TV? As for connecting the ‘Net itself, why not do a deal with BT to connect to the nearest BTWiFi-with-FON access point – they seem to be everywhere. There are lots of opportunities, but it just needs someone in Government to realise this and do something! Thanks Pete. Some really interesting ideas, I’d love to explore them further with you.